Paris has a long-standing reputation as the City of Love - it's also a reputation it can live up to. Love is written on many a street with names like Passage du Désir, rue de la Fidélité, and rue de Paradis, all of which can be found on a walk through the 10th arrondissement. In February, Paris is still in the deep midwinter. Temperatures are close to zero, making layers, long coats, and scarves are a prerequisite. If anything, being wrapped up as you walk hand-in-hand with your amour feels even more romantic. Why? Because it's February in Paris and there are so many romantic things to do. From making your own chocolate to strolling around the Tuileries together, Paris was made for lovers, because Paris is love. You might even get lucky enough to see the Eiffel Tower with a dusting of snow. Imagine that! Paris in February is awash with romance. So much so, we actively challenge you not to get back to your hotel singing L'hymne á l'amour. With that said, if you're the sort of person who doesn't enjoy Valentine's Day or you're single (same and same), Paris can get you in the spirit. It's never been said that Valentine's Day can't be spent alone on the Pont des Arts. Why should lovers get all the fun? Marina de Paris: With romantic cruise around the Seine and dinner. You'll see most of Paris's landmarks, drink wine, and catch the Eiffel Tower's legendary light show. February in Paris isn't just for Valentine's Day proposals and fancy new shoes from your beau. The weather at this time of year tends to make tourists steer clear, so in February, you'll be feeling more and more like a local. Towards the end of the month, some of fashion's biggest name designers display their Autumn-Winter ready-to-wear collections at Paris Fashion Week. The most fashionable human beings in the world descend from all over the world to Paris. If you feel more joie de vivre around the city than usual, it's probably Fashion Week; when the crowds that amass around the Grand Palais (Karl Lagerfeld's palace-of-choice) are draped in couture. Designers such as Chanel, Louis Vuitton, Balmain, and Valentino as well as Comme des Garçons and Isabel Marant show off their upcoming collections at PFW. The actual shows are by invite only, but there's still something about soaking up the very spirit of fashion in its home city. Insider tip: Fashionistas and fashionmisters, The Opera House is an ideal stay for you. Every February, the Asian community in Paris celebrates the Chinese New Year. Many Paris neighbourhoods are annually decked out for this glorious celebration of culture. Lanterns, firecrackers, dragons, and delicious Chinese food can be found all over the place - it's gastronomic! The main Chinese New Year parade takes place south of the river in the 13th arrondissement. The 13th is home to the Chinese Quarter and a large part of the Asian community. Over the course of the month, there are tonnes of exhibits and cultural workshops around the district. This main parade is also the oldest parade in Paris. You know what that means - huge crowds and massive fun. Insider tip: The Chinese New Year parade in Belleville goes through the 10th, 11th, 19th, and 20th arrondissements and is much calmer. Known as Saint-Fargeau, the festive Paris Carnival is a musical, costumed soirée throughout the streets of the city. It starts at Place Gambetta and finishes at Place de la République. The carnival has existed in records since the 15th century but went silent for many years during the 20th. Mardi Gras is part of it, but in the spirit of the Carnival, festivities shouldn't last only a day. If you like cheese and meat, then the Paris International Agricultural Show is for you. Its trade fair pulls in record crowds of all ages from all over the world. We won't say it's exclusively because you can pet the animals, but that might have something to do with it. The show is held annually on the last week of February at the Porte de Versailles. More apartments are available for rent during the winter months. Most Parisians vacate for somewhere warmer or, if they aren't native to the city, to be with their family. If you're interested in an apartment for February, look into this. There are so many more choices than at any other time. It's not only Parisians who vacate the City of Lights. Tourists do, too. Or, well, they just don't show up. The most popular times for tourists is around late Spring into Summer, or just before Christmas. No matter how many romantic vacations are happening in Paris in February, there'll still be more restaurants available and - even better - shorter queues. Should you venture into a Parisian bar or brasserie after 3 pm during the winter, your waiter might tell you they're no longer doing coffee. "Oh no," you might say. "What should I do to warm up?" The answer to this will always be: Grog. Essentially a rum hot toddy, pair it with a delicious crêpe and you'll never feel cold again. The Paris Winter Sales ("les soldes") run through January until the 20th of February. Get yourselves to the Galeries Lafayette. Montmartre, Amélie's Paris The most romantic arrondissement, Montmartre is known for its history and the Sacre-Coeur. 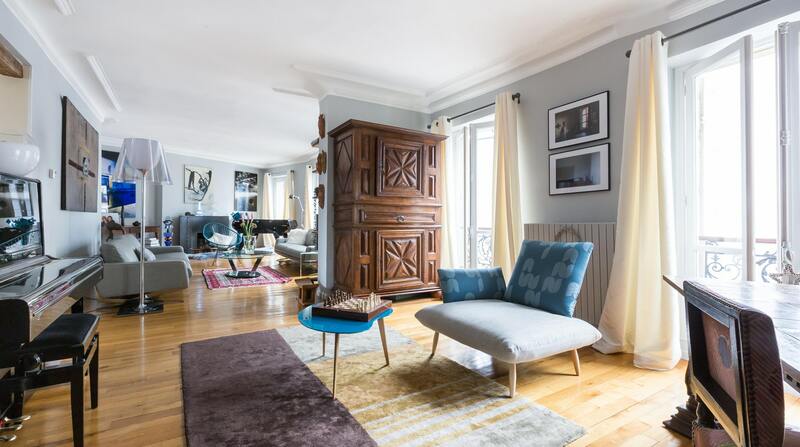 Take a stroll down rue des Abbesses. Paris Fashion Week, the Louvre & the Grand Palais From Chanel to Vuitton, PFW is spread widely throughout the Golden Triangle. Who will you spot? 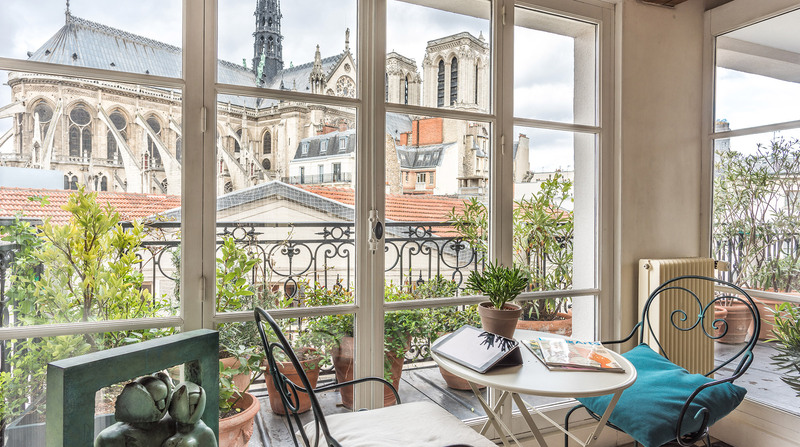 Saint-Germain-des-Prés, the Home of the Writers Dine in cafés frequented by carefree lovers Jean-Paul Sartre and Simone de Beauvoir or dip into one of the plentiful flower markets. Happy Days in The Marais A romantic February morning in one of the cafés down the Rue des Barres then onto Île de la Cité will inspire you. Chinese New Year in the Thirteenth The arrondissement to be in during Chinese New Year, the Chinese Quarter is slowly becoming more and more popular to visit. Beautiful Parks in the Outskirts of the City The Parc des Buttes Chaumont in the 19th arrondissement is the starting point of the Valentine's Day race - its beauty is beyond measure.